When writing system integration tests it often happens that I want to mount some tmpfses over directories like /etc/postgresql/ or /home, and run the whole script with an unshared mount namespace so that (1) it does not interfere with the real system, and (2) is guaranteed to clean up after itself (unmounting etc.) after it ends in any possible way (including SIGKILL, which breaks usual cleanup methods like “trap”, “finally”, “def tearDown()”, “atexit()” and so on). In gvfs’ and postgresql-common’s tests, which both have been around for a while, I prepare a set of shell commands in a variable and pipe that into unshare -m sh, but that has some major problems: It doesn’t scale well to large programs, looks rather ugly, breaks syntax highlighting in editors, and it destroys the real stdin, so you cannot e. g. call a “bash -i” in your test for interactively debugging a failed test. unshare -uim sh -- -c "`tail -n +7 $0`" "$0" "$@"
If anyone knows a trick which avoids the “tail -n +7″ hack and having to pay attention to passing around “$@”, I’d appreciate a comment how to simplify this. I just released Apport 2.7. The main new feature is supporting foreign architectures in apport-retrace. If apport-retrace works in sandbox mode and works on a crash that was not produced on the same architecture as apport-retrace is running on, it will now build a sandbox for the report’s architecture and invoke gdb with the necessary magic options to produce a proper stack trace (and the other gdb information). Right now this works for i386, x86_64, and ARMv7, but if someone is interested in making this work for other architectures, please ping me. This is rolled out to the Launchpad retracers, see for example Bug #1088428. So from now on you can report your armhf crashes to Launchpad and they ought to be processed. Note that I did a mass-cleanup of old armhf crash bugs this morning, as the existing ones were way too old to be retraced. For those who are running their own retracers for their project: You need to add an armhf specific apt sources list your per-release configuration directory, e. g. Ubuntu 12.04/armhf/sources.list as armhf is on ports.ubuntu.com instead of archive.ubuntu.com. Also, you need to add an armhf crash database to your crashdb.conf and add a cron job for the new architecture. You can see how all this looks like in the configuration files for the Launchpad retracers. The other improvement concerns package hooks. So far, when a package hook crashed the exception was only printed to stderr, where most people would never see them when using the GTK or KDE frontend. With 2.7 these exceptions are also added to the report itself (HookError_filename), so that they appear in the bug reports. The release also fixes a couple of bugs, see the release notes for details. With python-dbusmock you can provide mocks for arbitrary D-BUS services for your test suites or if you want to reproduce a bug. However, when writing actual tests for gnome-settings-daemon etc. I noticed that it is rather cumbersome to always have to set up the “skeleton” of common services such as UPower. python-dbusmock 0.2 now introduces the concept of “templates” which provide those skeletons for common standard services so that your code only needs to set up the particular properties and specific D-BUS objects that you need. These templates can be parameterized for common customizations, and they can provide additional convenience methods on the org.freedesktop.DBus.Mock interface to provide more abstract functionality like “add a battery”. In both cases upower --dump or gnome-power-statistics will show you the expected devices (of course you need to run that within the environment of the fake $DBUS_SYSTEM_BUS_ADDRESS, or run the mock on the real system bus as root). Iftikhar Ahmad contributed a template for NetworkManager, which allows you to easily set up ethernet and wifi devices and wifi access points. See pydoc3 dbusmock.templates.networkmanager for details and the test cases for how this looks like in practice. I just released python-dbusmock 0.2.1 and uploaded the new version to Debian experimental. I will sync it into Ubuntu Raring in a few hours. For writing tests for GVFS (current tests, proposed improvements) I want to run Samba as normal user, so that we can test gvfs’ smb backend without root privileges and thus can run them safely and conveniently in a “make check” environment for developers and in JHBuild for continuous integration testing. Before these tests could only run under gvfs-testbed, which needs root. Unlike other servers such as ssh or ftp, this turned out surprisingly non-obvious and hard, so I want to document it in this blog post for posterity’s benefit. Running smbd itself is mainly an exercise of figuring out all the options that you need to set; Alex Larsson and I had some fun figuring out all the quirks and hiccups that happen between Ubuntu’s and Fedora’s packaging and 3.6 vs. 4.0, but finally arrived at something working. First, you need to create an empty directory where smbd can put all its databases and state files in. For tests you would use mkdtemp(), but for easier reading I just assume mkdir /tmp/samba here. For running this as a normal user you need to set a port > 1024, so this uses 1445 to resemble the original (privileged) port 445. The map to guest line makes anonymous logins work on Fedora/Samba 4.0 (I’m not sure whether it’s a distribution or a version issue). Don’t ask about “dir” vs. “directory”, that’s an inconsistency in Samba; with above names it works on both 3.6 and 4.0.
which you are welcome to copy&paste (you can replace “myuser” with any valid user name, of course). The main problem with this approach is that smbd exits (“Server exit (failed to receive smb request)”) after a client terminates, so you need to write your tests in a way to only run one connection/request per test, or to start smbd in a loop. with that, you can use smbclient or any program using libsmbclient to talk to our test smb server running as user. I found it surprisingly hard to determine in tearDown() whether or not the test that currently ran succeeded or not. I am writing some tests for gnome-settings-daemon and want to show the log output of the daemon if a test failed. I now cobbled together the following hack, but I wonder if there’s a more elegant way? The interwebs don’t seem to have a good solution for this either. I was working on writing tests for gnome-settings-daemon a week or so ago, and finally got blocked on being unable to set up upower/ConsoleKit/etc. the way I need them. Also, doing so needs root privileges, I don’t want my test suite to actually suspend my machine, and using the real service is generally not suitable for test suites that are supposed to run during “make check”, in jhbuild, and the like — these do not have the polkit privileges to do all that, and may not even have a system D-Bus running in the first place. So I wrote a little test_upower.py helper, then realized that I need another one for systemd/ConsoleKit (for the “system idle” property), also looked at the mock polkit in udisks and finally sat down for two days to generalize this and do this properly. The result is python-dbusmock, I just released the first tarball. With this you can easily create mock objects on D-Bus from any programming language with a D-Bus binding, or even from the shell. The mock objects look like the real API (or at least the parts that you actually need), but they do not actually do anything (or only some action that you specify yourself). You can configure their state, behaviour and responses as you like in your test, without making any assumptions about the real system status. When using a local system/session bus, you can do unit or integration testing without needing root privileges or disturbing a running system. The Python API offers some convenience functions like “start_session_bus()“ and “start_system_bus()“ for this, in a “DBusTestCase“ class (subclass of the standard “unittest.TestCase“). Surprisingly I found very little precedence here. There is a Perl module, but that’s not particuarly helpful for test suites in C/Vala/Python. And there is Phil’s excellent Bendy Bus, but this has a different goal: If you want to thoroughly test a particular D-BUS service, such as ensuring that it does the right thing, doesn’t crash on bad input, etc., then Bendy Bus is for you (and python-dbusmock isn’t). However, it is too much overhead and rather inconvenient if you want to test a client-side program and just need a few system services around it which you want to set up in different states for each test. You can use python-dbusmock with any programming language, as you can run the mocker as a normal program. The actual setup of the mock (adding objects, methods, properties, etc.) all happen via D-Bus methods on the “org.freedesktop.DBus.Mock“ interface. You just don’t have the convenience D-Bus launch API. If you use it with Python, you get access to the dbusmock.DBusTestCase class which provides some convenience functions to set up and tear down local private session and system buses. If you use it from another language, you have to call dbus-launch yourself. Please see the README for some more details, pointers to documentation and examples. Update: You can now install this via pip from PyPI or from the daily builds PPA. Update 2: Adjusted blog entry for version 0.0.3 API, to avoid spreading now false information too far. I just released Apport 2.5 with a bunch of new features and some bug fixes. Apport now also looks for package hooks in /opt (#1020503) if the executable path or a file in the package is somewhere below /opt (it tries all intermediate directories). With these two, we should have much better support for filing bugs against ARB packages. This version also finally drops the usage of gksu and moves to PolicyKit. Now we only have one package left in the default install (update-notifier) which uses it. Almost there! A few weeks ago I wrote about my new role as an upstream QA engineer. I have now officially been in that role since June. Quite expectedly I had (and still have) some backlog from my previous Desktop engineer role, but I have had plenty of time to work on automatic tests and some test technology now. If you are interested in the daily details, you can look at the ramblings on my G+ page; in a nutshell I worked on integration tests for udisks2 (mostly upstream now), a mock polkit API, and a small enhancement of the scsi_debug kernel module. On the distro QA side I got the integration tests of udisks2, upower, PostgreSQL, Apport, and ubuntu-drivers-common working and added to our Jenkins autopkgtest runner, where they are executed whenever the particular package or any of its dependencies get updated. This already uncovered a surprising number of actual bugs, so I’m happy that this system starts being useful after the initial hump of getting the tests to run properly in that environment. In that previous blog post I mentioned that Canonical will hire a second person for an upstream QA engineer role. I am pleased that the job posting is now online, so if you are familiar with how the Linux plumbing and desktop stacks work, are frantic about testing, like to work with the Linux, plumbing, GNOME, and other FOSS communities, know your way around jhbuild, Jenkins, and similar technologies, and would like to explore new possibilities like applying static code checking or creating APIs to fake hardware, please have a look at the role description! Please feel free to contact me on IRC (pitti on Freenode) or by email if you have further questions about the role. 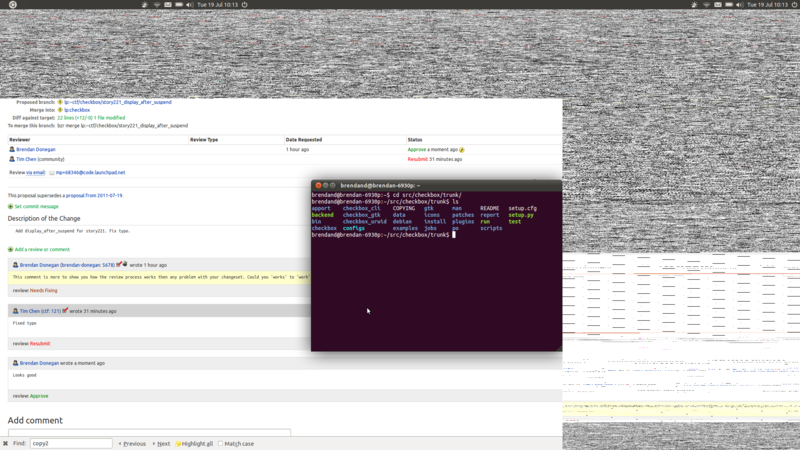 As I wrote two weeks ago, I consider the QA related changes in Ubuntu 12.04 a great success. But while we will continue and even extend our efforts there, this is not where the ball stops: it’s great to have the feedback cycle between “break it” and “notice the bug” reduced from potentially a few months to one day in many cases, but wouldn’t it be cool to reduce that to a few minutes, and also put the machinery right at where stuff really happens — into the upstream trunks? If for every commit to PyGObject, GTK, NetworkManager, udisks, D-BUS, telepathy, gvfs, etc. we’d immediately build and test all reverse dependencies and the committer would be told about regressions? I have had the desire to work on automated tests in Linux Plumbing and GNOME for quite a while now. Also, after 8 years of doing distribution work of packaging and processes (tech lead, release engineering/management, stable release updates, etc.) I wanted to shift my focus towards technology development. So I’ve been looking for a new role for some time now. It seems that time is finally there: At the recent UDS, Mark announced that we will extend our QA efforts to upstream. I am very happy that in two weeks I can now move into a role to make this happen: Developing technology to make testing easier, work with our key upstreams to set up test suites and reporting, and I also can do some general development in areas that are near and dear to my heart, like udev/systemd, udisks, pygobject, etc. This work will be following the upstream conventions for infrastructure and development policies. In particular, it is not bound by Canonical copyright license agreements. Making it possible/easier to write tests with fake hardware. E. g. in the upower integration tests that I wrote a while ago there is some code to create a fake sysfs tree which should really go into udev itself, available from C and introspection and be greatly extended. Also, it’s currently not possible to simulate a uevent that way, that’s something I’d like to add. Right now you can only set up /sys, start your daemon, and check the state after the coldplugging phase. Interview some GNOME developers what kind of bugs/regressions/code they have most trouble with and what/how they would like to test. Then write a test suite with a few working and one non-working case (bugzilla should help with finding these), discuss the structure with the maintainer again, find some ways to make the tests radically simpler by adding/enhancing the API available from gudev/glib/gtk, etc. E. g. in the tests for apport-gtk I noticed that while it’s possible to do automatic testing of GUI applications it is still way harder than it should and needs to be. I guess that’s the main reason why there are hardly any GUI tests in GNOME? I’ve heard from several people that it would be nice to be able to generate some mock wifi/ethernet/modem adapters to be able to automatically test NetworkManager and the like. As network devices are handled specially in Linux, not in the usual /dev and sysfs manner, they are not easy to fake. It probably needs a kernel module similar to scsi_debug, which fakes enough of the properties and behaviour of particular nmetwork card devices to be useful for testing. One could certainly provide a pipe or a regular bridge device at the other end to actually talk to the application through the fake device. (NB this is just an idea, I haven’t looked into details at all yet). There are nice tools like the Clang static code analyzer out there. I’d like to play with those and see how we can use it without generating a lot of false positives. Robustify jhbuild to be able to keep up with building everything largely unattended. Right now you need to blow away and rebuild your tree way too often, due to brittle autotools or undeclared dependencies, and if we want to run this automatically in Jenkins it needs to be able to recover by itself. It should be able to keep up with the daily development, automatically starting build/test jobs for all reverse dependencies for a module that just has changed (and for basic libraries like GLib or GTK that’s going to be a lot), and perhaps send out mail notifications when a commit breaks something else. This also needs some discussion first, about how/where to do the notifications, etc. Other ideas will emerge, and I hope lots of you have their own ideas what we can do. So please talk to me! We’ll also look for a second person to work in that area, so that we have some capacity and also the possibility to bounce ideas and code reviews between each other. I just uploaded Apport 2.1 to Quantal. A big change in that version is that the whole code now works with both Python 2 and 3, except for the launchpadlib crash database backend (as we do not yet have a python3-launchpadlib package). I took some care that apport report objects get along with both strings (unicode type in Python 2) and byte arrays (str type in Python 2) in values, so most package hooks should still work. However, now is the time to check whether they also work with Python 3, to make the impending transition to Python 3 easier. However, you need to watch out if you use projects or scripts which directly use python-apport to process reports: The open(), write(), and write_mime() methods now require the passed file descriptors to be open in binary mode. You will get an exception otherwise. The “with” context is not strictly required, but it takes care of timely closing the files again. This avoids ResourceWarning spew when you run this in test suites or enable warnings. Half a year ago I blogged about the changed expectancies and processes to improve quality of the development release which we discussed at the UDS in Orlando: A promise that we don’t break the development version, regressions are not to be tolerated, acceptance criteria for Canonical upstreams. For that we introduced the Stable+1 team, actually did some reversions of broken packages, our QA team set up rigorous daily installation image and upgrade tests, and the code development process for Unity and related project was changed to enforce buildability and passing automatic tests with each and every change to trunk. To be honest I was still a tad sceptic back then when this was planned. These were a lot of changes for one cycle, the stable+1 team was a considerable resource investment (starting with three people fulltime in the first few months), and not to the least our friends in the DX team felt thwarted because they had to sit down for a long time developing tests, and then changing their habits and practices for development. So was all that effort worth it? It was nice to not have to sit down for an hour every cople of days to figure out how to get back my desktop after the daily dist-upgrade bricked it. Unity, compiz, and friends were remarkably stable. I still remember the previous cycles where every new version got differently crashy, broke virtual workspaces, and what not. The worst thing that happened this cycle is eternally breaking keybindings (or changing them around), but at least those usually had obvious workarounds. As a result of those, I think we had at least one, maybe two magnitudes more testers of the daily development release than in previous cycles. So we got a lot of good bug reports and also patch contributions for smaller issues in Precise which we otherwise would not have discovered. The daily dist-upgrade tests tremendously helped to uncover packaging problems which would break real-world upgrades out there by the dozens. It took months to fix the hardest one: upgrading 10.04 LTS to 12.04 LTS with all universe packages offered in software-center. This beast takes 13 hours to run, so nobody really did manual tests like that in the past cycles. Due to the daily automatic CD image builds we dramatically reduced both the cost of fixing regressions as well as the emergency hackathons during milestone preparations. It is a lot easier to unbreak e. g. LVM setup or OEM install modes on our images when the regression happened just a day before than discovering it two days before a milestone is due, as again nobody tests these less common modes very often. So as a result, I really think the investments into QA and the stable+1 teams already paid off twofold by giving us more time to work on the less critical fixes, avoiding lots of user frustration about broken upgrades, and generally making the daily development a lot more enjoyable. Or, as Rick Spencer puts it: Velocity, velocity, velocity! Despite these improvements, there are still some improvements I’m looking forward to in the next cycles: Thanks to Colin Watson we can now use -proposed as a proper staging area, and used this feature rather extensively in the past month. From my point of view, 90% of the remaining daily dist-upgrade failures were due to packages building on different architectures at vastly different times, or failing on some, but not all architectures (“arch skew”). This is something you cannot really predict or guard against as a developer when you upload large and potentially harmful packages directly to the development release, so uploading them to the staging area and letting everything build there will reduce the breakage to zero. This was successfully demonstrated with Unity, GTK, and other packages where arch skew pretty much always causes people to hose their desktop, as well as daily CD images not working. I’m also looking forward to combining the staging area with lots of automatic tests against reverse dependencies (e. g. testing the installer against a new GTK or pygobject before it lands), something we just barely tipped our toes in. I can’t imagine how we were ever able to develop our new releases the old way. Precise Pangolin^W^WUbuntu 12.04, I’m proud of you! Go out and amaze people! Part of our efforts to reduce power consumption in Ubuntu is to provide an easy tool to hunt down which programs and devices are to blame for inordinate power consumption. powertop’s interactive mode is pretty good for this if you are sitting in a train and want to tweak some knobs to max out battery life, but we need something more reproducible and noninteractive for developers who want to file proper bug reports. So I wrote a little script power-usage-report which calls fatrace for measuring file access activity from programs, and powertop-1.13 to measure process and device wakeups, clean up and sort their ouput, and generate a report which is appropriate to attach to bug reports, send around, put into Jenkins for measuring daily progress, etc. It is now part of fatrace version 0.4, so today’s Precise upgrades will have it. programs are not busy with active tasks other than the one you want to examine. You can redirect output to a file, of course. The top header (“Starting measurement..” etc.) will go to stderr and thus not be part of the redirected output. The archive consistency reports like component-mismatches, uninstallability, etc. now appear about 20 minutes earlier than in oneiric. CD image builds can now happen 30 minutes earlier after the publisher start, and are much quicker now due to moving to newer machines. We can now build an i386 or amd64 CD image in 8 minutes! Currently they still need to wait for the slow powerpc buildd, but moving to a faster machine there is in progress. These improvements lead to much faster image rebuild turnarounds. Candidate CDs now get automatically posted to the new ISO tracker as soon as they appear. Whenever a new Ubuntu image is built (daily or candidate), they automatically get smoke-tested, so we know that the installer works under some standard scenarios and produces an install which actually boots. Due to the new discipline and the stable+1 team, we had working daily ISOs pretty much every day. In previous Alphas, the release engineer(s) pretty much had to work fulltime for a day or two to fix the worst uninstallability etc., all of this now went away. All this meant that as a release engineer almost all of the hectic and rather dull work like watching for finished ISO builds and posting them or getting the archive into a releasable state completely went away. We only had to decide when it was a good time for building a set of candidate images, and trigger them, which is just copy&pasting some standard commands. So I could fully concentrate on the interesting bits like actually investigating and debugging bug reports and regressions. As the Law of Conservation of Breakage dictates, taking away work from the button pushing side just caused the actual bugs to be much harder and earned us e. g. this little gem which took Jean-Baptiste, Andy, and me days to even reproduce properly, and will take much more to debug and fix. In summary, I want to say a huge “Thank you!” to the Canonical QA team, in particular Jean-Baptiste Lallement for setting up the auto-testing and Jenkins integration, and the stable+1 team (Colin Watson, Mike Terry, and Mathieu Trudel-Lapierre in November) for keeping the archive in such excellent shape and improving our tools! Apport and the retracer bot in the Canonical data center have provided server-side automatic closing of duplicate crash report bugs for quite a long time. As we have only kept Apport crash detection enabled in the development release, we got away with this as bugs usually did not get so many duplicates that they became unmanageable. Also, the number of duplicates provided a nice hint to how urgent and widespread a crash actually was. This probably caused a lot of frustration when a reporter of the crash spent time, bandwidth, and creativity to upload the crash data and create a description for it, only to find that it got closed as a duplicate 20 minutes later. Some highly visible crashes sometimes generated up to a hundred duplicates in Launchpad, which was prone to timeouts, and needless catch-up by the retracers. We plan to have a real crash database soon, and eventually want to keep Apport enabled in stable releases. This will raise the number of duplicates that we get by several magnitudes. For common crashes we had to write manual bug patterns to avoid getting even more duplicates. So with the just released Apport 1.90 we introduce client-side duplicate checking. So from now, when you report a crash, you are likely to see “We already know about this” right away, without having to upload or type anything, and you will get directed to the bug page. You should mark yourself as affected and/or subscribe to the bug, both to get a notification when it gets fixed, and also to properly raise the “hotness” of the bug to bubble up to developer attention. As library dependencies can change, we have more than one architecture, and the faulty function can be called from different entry points, there can be many address signatures for a bug, so the database maintains an N:1 mapping. In its current form the signatures are taken as-is, which is much more strict than it needs to be. Once this works in principle, we can refine the matching to also detect duplicates from different entry points by reducing the part that needs to match to the common prefix of several signatures which were proven to be a duplicate by the retracer (which gets a fully symbolic stack trace). The retracer bots now exports the current duplicate/address signature database to http://people.canonical.com/~ubuntu-archive/apport-duplicates in an indexed text format from where Apport clients can quickly check whether a bug is known. For the Launchpad crash database implementation we actually check if the bug is readable by the reporter, i. e. it is private and the reporter is in a subscribed team, or the bug is public; if not, we let him report the bug anyway and duplicate it later through the existing server-side retracer, so that the reporter has a chance of getting subscribed to the bug. We also let the bug be filed if the currently existing symbolic stack trace is bad (tagged as apport-failed-retrace) or if a developer wants a new symbolic stack trace with the current libraries (tagged as apport-request-retrace). As this is a major new feature, I decided that it’s time to call this Apport 2.0. This is the first public beta towards it, thus called 1.90. With Apport’s test driven and agile development the version numbers do not mean much anyway (the retracer bots in the data center always just run trunk, for example), so this is as good time as any to reset the rather large “.26″ minor version that we are at right now. I arrived back home in Augsburg, from last week’s Ubuntu Developer Summit in Orlando, FL. As this is a quality/LTS cycle, we pretty much already knew in advance what to do (bug fixing, bug fixing, some boot speed, and did I mention bug fixing? ), but still we had many highly interesting and exciting sessions this time, not so much about what we are going to do, but how we are going to build 12.04. So far our common practice has been to toss everything new into the development release until Feature Freeze and then try and clean up most of the fallout. Me and many other developers have always cried for having more time for fixing long-standing bugs and not introducing breakage in the first place. It seems that now with 12.04, Ubuntu/Canonical are actually getting serious about it. (Any resemblance to that postcard from the Kennedy Space Center which I went to last Sunday is of course absolutely unintended and purely coincidental ). The mission statement is now to have working ISOs, stable ? development, and daily intra-development upgrades every day, quick and regular cleanup of uninstallable packages, component-mismatches, NBS etc., backed by a new “stable +1″ team backed by three people on a rotational shift. QA team is now setting up daily automatic smoketesting of the installer and other packages which have tests. For the latter we’ll convert some packages to the DEP-8, the proposed format for running autopkgtest on (I’ll do udisks, postgresql-common, pygobject, apport, and jockey soon). We’ll try do put uploads which might break something (like new libraries) to a staging area first, against which we can run test suites of reverse dependencies before it lands in the new release. As doing this on a large scale still requires infrastructure to be created, we’ll only exercise it for a few packages by uploading to precise-proposed first, but this has a high potential for extension. We want to commit to fixing major breakage within 3 hours of development time, or otherwise revert the faulty package to the previous version (unless that aggravates problems, such as file conflicts). Finally, for Canonical upstreams we are introducing “acceptance criteria”, which will hopefully significantly raise the quality and lower the regressions of each Unity etc. release. So, the mission is clear. In practice we’ll probably have to make some real-life concessions, and Murphy’s law dictates that there still will be some breakage, but we can learn from that as we go. On a rather calm ten-hour flight to Orlando I once again did some pygobject, udisks, and Apport hacking (It’s scary how productive one can be when not constantly being interrupted by IRC, email, etc). One more visible change amongst these was finally fixing a five year old five-digit bug to integrate apport-retrace into the GUI, now that it does not potentially wreck your installation any more. I know this dialog is not a beauty, as it’s implemented using the ui_question_choice() API which is used by package hooks. That makes it work for all available UIs (GTK, KDE, CLI), though, and can easily be extended to have more actions. And if you get this far and want to stack traces, you are used to looking at eye-bleeding gibberish anyway.. Presumably the most useful (and default) action is to download all the debug symbols, open a Terminal, and put you into a GDB session with all these, and the core dump loaded, so that you can poke around the crashed program state with all symbols available. But you can also run gdb without downloading debug symbols, or just update the .crash report file with a fully symbolic stack trace. This works just as well in apport-cli, but not yet in the KDE version: Someone needs to implement the equivalent of the apport-gtk implementation to apport-kde and kde/bugreport.ui, i. e. show an “Examine locally” button if self.can_examine_locally() is true, and add an appropriate ui_run_terminal() method (which should be fairly similar to the GTK one, just with Qt/KDEish terminal emulators). But as Kubuntu does not currently use Apport (and also because I didn’t have all the dependencies installed on my laptop) I did not yet do this. Please catch me on IRC/mail/merge proposal if you want to work on this. If you look at above commit, the changes to the GtkBuilder file look huge, but that’s only because I haven’t touched it for ages and the current Glade shuffled the elements quite a bit; it just adds the button to the dialog. For now this is all sitting in trunk, I’ll do a new upstream release and Ubuntu precise upload soon. The tool to reprocess an Apport crash report to produce a symbolic stack trace, apport-retrace, has been pretty hard to use on a developer system so far: It either installed the packages from the crash report, plus its debug symbol packages (“ddebs”) into the running system (which frequently caused problems like broken dependencies), or it required setting up a chroot and using apport-chroot with fakechroot and fakeroot. I’m happy to announce that with Apport 1.22, which landed in Oneiric yesterday, this has now become much easier: In the default mode it just calls gdb on the report’s coredump, i. e. expects that all the necessary packages are already installed and will complain about the missing ones. But with the new --sandbox/-Smode, it will just create a temporary directory, download and unpack packages there, and run gdb with some magic options to consider that directory a “virtual root”. These options haven’t been available back when this stuff was written the first time, which is why it used to be so complicated with fakechroots, etc. Now this does not need any root privileges, chroot() calls, etc. As it only downloads and installs the bare minimum, and does not involve any of the dpkg/apt overhead (maintainer scripts, etc. ), it has also become quite a lot faster. That’s how the apport retracers were able to dig through a backlog of about a thousand bugs in just a couple of hours. to be put into a gdb session. If you do this regularly, it’s highly recommended to use a permanent cache dir, where apt can store its indexes and downloaded packages: Use -C ~/.cache/apport-retrace for this (or the long version --cache). You can also use this to reprocess crashes for a different release than the one you are currently running, by creating a config directory with an appropriate apt sources.list. Enjoy, and let me know how this works for you! Hot on the heels of the Announcement of the second 9.1 Beta release there are now packages for it in Debian experimental and backports for Ubuntu 10.04 LTS, 10.10. and 11.04 in my PostgreSQL backports for stable Ubuntu releases PPA. Warning for upgrades from Beta 1: The on-disk database format changed since Beta-1. So if you already have the beta-1 packages installed, you need to pg_dumpall your 9.1 clusters (if you still need them), and pg_dropcluster all 9.1 clusters before the upgrade. I added a check to the pre-install script to make the postgresql-9.1 package fail early to upgrade if you still have existing 9.1 clusters to avoid data loss.